This painting is one of four "St Quilta Blesses the Year of the Horse" paintings on wood. 12"h x 16"w.
Topics in this diary: Memory of Mom, Mom's wake, Jimmy's new leather and his birthday, Madd Maxx, St Q's Christmas Cookies, family at Christmas, the Zodiac paintings and my show of them, The Cream and Sugar / Lovers, the newest piece in The Kitchen Tarot: The Rolling Pin / Chariot, January, 2002 art camp, and Baby Fridge. First of all, I need to say I've never started work this late on any of my diaries, taking it so up to the wire. It's the 30th and all I have is my pictures ready to go. Still need to write all the diary copy and import the pix, then fetch them all to the internet. Yikes! I know I won't get very far tonight, because first of all, I'm starving! But it's good to be sitting down to work on this at long last, especially since my Nov. 30 diary was all about Mom. Funny how everything just slides out of the way when something as terrible as your mother's death happens. So now I'm going to talk about Life again. I think Mom would appreciate that. I'll get some work done tonight and will keep adding to this diary for a few days, as this bi-monthly effort usually gets created over about two or three weeks! Not this time! It's short for now, but will be at least a little longer eventually. Now it's time to head out with Jimmy to a nice Chinese buffet called The Temple of Heaven. Wouldn't that be a great name for an art show challenge theme? Just to say one more thing for now about Mom. Here is the little piece I started in her hospital room when she was in her last week of life. She was in a light coma and stayed in the same position for so long, I decided to draw her. I used a Bic pen on the quilt sandwich. Later I hand embroidered the whole thing with thoughts and references to Mom. It's got some beading on it, too. It's a very little quilt, but my favorite one right now. I had it in the show at Jewel Heart, which I'll talk more about later. 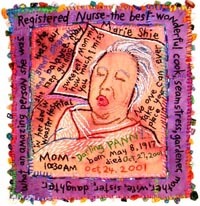 "Memory of Mom" is 10"h x 9.5"w.
After Mom's funeral, we had her wake, since we'd had one for Dad a year and a half ago. 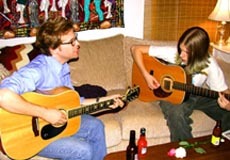 Gretchen and Mike were of course home, and here are Michael and our nephew Jacob playing guitar together. It was a smaller group this time, partly since Paul the Preacher lives in California now and couldn't be there. 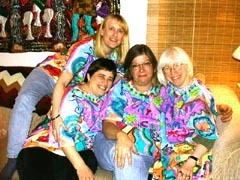 But we all had a good time and felt better for making music, being together, and telling stories about Mom together. I had said I didn't want any little kids at the wake, but very late in the evening, Aimee came to the door and said, "I know you said no kids, but THIS is a little kitty." 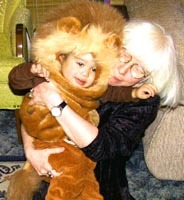 She then presented Omari in his Halloween costume, a furry lion suit! It had a great big furry head on it, and he wore it the rest of the night! You can see he has me wrapped around his finger! And yes, I'll be ready for Gretchen and Mike to have kids, when they get around to it! 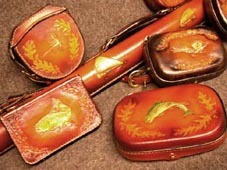 All these cases and more went to one woman in Austin, who ordered eight custom made cases from Jimmy back in April, for her Christmas presents to fly fishermen and fisherwomen in her life. When the recession hit us in the summer, we were really thrilled, more even than before, to have Eileen's orders! And he got them all done on time, along with other orders for presents. The long thing on the diagonal is a case for a fishing rod. We had a little birthday party for Jimmy on November 26, when he turned 48. 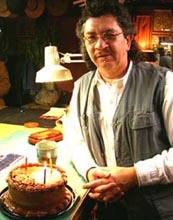 He's in his studio with his chocolate cake and some friends. The cake looked like it had been tooled out of leather, but was much tastier! 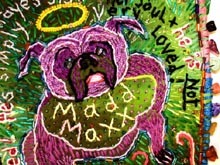 "Madd Maxx" is a little commission, I think around 6 3/4 x 6 3/4", made for my friend Faye Geller, an artist and art quilter who lives in Keene, NH. Maxx is her constant companion, a sassy little pug dog. Since she shamelessly baby talks to him, I ended up giving him a big, but that wasn't part of her request. The real story is that Maxx ripped up Faye's new glasses, so she had to go right back to the eye doctor, and they found the very earliest stage of glaucoma. So she realized that Maxxy Boy is her guardian angel. So, no, he is not dead. 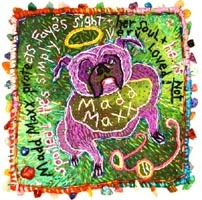 Maxx is all hand embroidered on some lovely Lunn Fabric, on which I drew with a permanent marker, like I always do. I added bugle beads and, around the edge, gemstone chips for lots of good vibrations. Maxx's eyes have blue topaz for their irises. This year it was our turn to host the big Snyder Family Christmas, at Oak Grove Mennonite Church. "Our" being my brothers, sister, me, and our spouses. OK, Larry and Sherry aren't married yet, but a Spring wedding is being planned! Front row, next to Jimmy and me are my sister Debi and her husband John Ondrik. 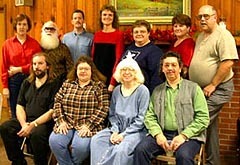 Back row, from right are brother Larry, Sherry, Larry's ex-wife Donna, whom we all adore, Larry and Donna's daughter, my niece Nancy and her husband Wayne Yoder, my brother Jimmy and his wife Lyn. Missing from the picture are many kids, including our Gretchen and Mike. We were in a group show at Thirteen Moons Gallery in Santa Fe over Christmas, and they put a picture of this quilt into American Craft Magazine as a full page ad! 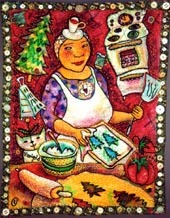 The piece is called "St Quilta's Christmas Cookies." I guess making this image was one of the first times I consciously realized how much my mom was responsible for the St Quilta personality! No, I guess I knew all along. Anyhow, this is really Mom baking her wonderful buttermilk Christmas cutout cookies, the ones you frost while they're still hot, and then you can put those sugar sprinkles on the melted frosting, and it sticks. And when they're fresh, the cooky edges are crunchy, but the insides are very soft. Oh, man. How I could eat those, before Middle Age Spread robbed me of desserts! "St Q's Christmas Cookies" is 30"h x 22.5"w.
After Mom died, in fact, within a week, I started a series of paintings on stretched canvases, in which St Quilta the Comforter blesses the Zodiac. Each panel is 24"h x 18"w, and they all have this basic format. So they're like big flash cards for the signs. Looking at them, you can find out lots of things about that constellation. Here's the first one, Aries, in which the St Q doesn't really look like Mom yet, but by the time I got to drawing the toaster and the stove, I was realizing that I was inventorying Mom's belongings in my head and using her stuff to illustrate the painting. Then I realized she's always been the model for St Quilta, so why not make her face be Mom's??? I made all 12 paintings in just over a month and made a book about Mom and the zodiac paintings, with hand written text and black and white photos of all the paintings. On December 14, we hung and opened a show of these art pieces and some of Jimmy and my quilts at Jewel Heart Cleveland, a Center for Buddhism and Tibetan Culture, in Tremont. It was a very good experience, both making the pieces, because it helped me grieve for Mom, as I rummaged through my memories of her and her things, to illustrate the signs, and also in showing the works, because it let me celebrate my mother's life. 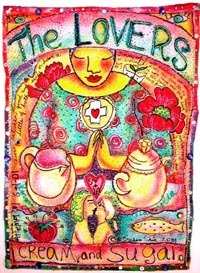 Then after the opening, I put a gallery page on this site about the zodiac paintings and the Jewel Heart installation. In the next week I'll get back into that page and add the stuff I wrote around the side edges of all the paintings, to be the text beside the paintings in the gallery page. I wrote a lot there on those skinny sides! We did two gallery walks in Tremont, in Dec and Jan, and then I taught a one day workshop Jan 26, the day we ended up taking the show down. 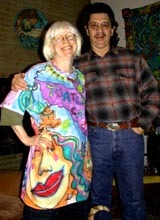 It was the first show at Jewel Heart, which was the artist Angelica Poza's studio before it became the Buddhist center. This is me and Mom, as St Quilta, as Taurus, the sturdy provider with her Sunbeam Mixmaster and her TroyBilt Rototiller and her big Union Loom. 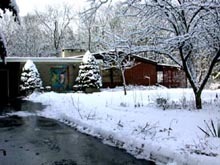 The picture was taken during the January Art Walk, in Tremont. When I did a workshop there on Jan 26, I met the owner of Doubting Thomas Gallery, also in Tremont, and she invited me to put work into her gallery's Valentine show, so now I'm working on a little piece about me and Jimmy and a black velvet heart. My friends Kate and Luis Arango are also going to put work into the show, so we'll be going up on Feb 8 for the next Tremont Art Walk. If you live anywhere near Cleveland, you need to check out this lively art scene! Finally got this piece finished. 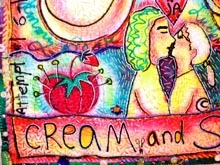 "The Cream and Sugar / Lovers: Card #6 in The Kitchen Tarot" got started in a Turtle Art Camp on June 1, 2001, and just got finished last week! It got a ton of hand work over its original airbrush painting, and lots of beading. A ton of french knots make a texture resembling chenille. 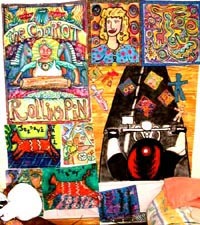 We entered this in the Quilt San Diego Visions exhibition competition, so we'll see if it gets in. "The Cream and Sugar / Lovers" is 35"h x 25"w.
Also, it's now at The Ohio Craft Museum in Columbus, in a show called "Couples: Side by Side in the Studio." At the reception on Sunday afternoon, Feb 17, we'll do a panel discussion of what it's like to be married and have both partners making art for a living. Our dear pals Debra Lunn and Michael Mrowka also have work in this show. 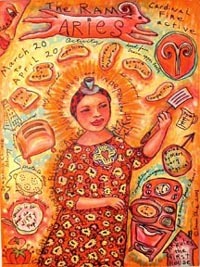 Besides this piece, we'll have two other Kitchen Tarot pieces: "The Stove / Empress," and "The Colander / Fool." Jimmy will have three pieces of his fine leather work. The show's up til April 7. A smoochy detail of "The Cream and Sugar / Lovers..."
I just thought I'd throw in a nice shot of the one and only really good snow we had this winter. It was early January, I think. Maybe we've had two good snows. This one stuck around for days, as a little more snow would come each day, to replace anything that had melted away. It was very pretty coming down, in those big fat flakes that only happen when the temp's in the high 20s or low 30s. It was so pretty on the tree branches, too. 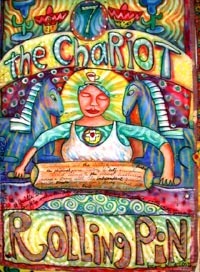 The current Kitchen Tarot piece that is almost finished is "The Rolling Pin / Chariot." It's around 45" h x 35"w. A teensy smaller than the piece "Liberty Weeps for her Country." Like "Liberty", it has a very devcloped painting to start with, with regular acrylic brushed over the airbrush whole cloth painting. It has more depth than "The Cream and Sugar," but THAT piece has more hand work than this one or "Liberty." In "The Rolling Pin," St Q is weilding a gigantic rolling pin that Jimmy machine sewed the writing over my handwriting on. Two things that look here like blue zebras are supposed to be sphinxes, like in the Waite-Rider tarot deck. I put our fave margaritas at the top, with Willy and Marigold cats wearing beaded red sombreros. I did a lot of free motion machine quilting on this piece, but am still going around, doing hand sewing/quilting on it, and it has a ton of beads that sparkle a lot. Q's apron has iridescent sequins and seed beads sewn all over it, and her halo is full of french knots. When I get a chance to reshoot this piece with my trusty Nikon digital camera, I'll add a final look picture here, I hope. For now, I've had enough. It's 9 pm, and by the time I clean this diary all up, put everything on the server site, and test it all, and then troubleshoot, which could have to happen, it'll be maybe 11 pm. Time when I like to go get some lapwork and sit with Jimmy in the living room...at least by 11:30 pm, and let the day unwind! Here's our January 6 - 12, 2002 Turtle Art Camp report! We had three students: Lisa Harvey (left) of Donnellson, IA; Susan Sorrell of Greenville, SC; and Paget Rose of Cleveland, OH. 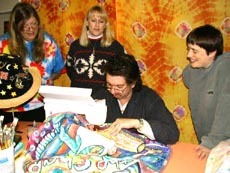 In this picture, Jimmy's doing his machine free-motion embroidery demo, using the painting I had made and ssandwiched, for The Rolling Pin / Chariot, in above photo. He was sewing a zig-zag stitch over my handwritten message on the rolling pin itself, so the writing would show up much more richly and be quilted. We found out from this piece that you don't want to do this over heavy paint! Jimmy ended up spending about six hours to finish the writing on the rolling pin only. Heavy paint clogs the weave and breaks the machine thread. Next quilt I went back to fabric paint for the non-airbrush second layer of paint. Using Deka's covering white, it still made it very hard to keep the thread in line, not misbehaving. If you only airbrush or use transparent paints, you're safe doing the machine work. Debra Lunn and Michael Mrowka tell me to get some Setacolors for this, because they don't clog the weave. Guess I'd better listen! Here is the week's art all put up together by the students, who tastefully arranged it, both so that it would fit together well and also be a good compostition. It was tricky with Lisa's very dominant biker guy going down the high way panel, bottom right. Susan's painted panels are above the black panel, top right, and Paget's cats are running around in the lower left part. Everyone's first day samplers are on the black highway, an attempt to break up that strong black. One of our last things to do was to heatset our tee shirts and pose with them. You can see that this was one of our very playful weeks, and I have wild photos I can't show you here! We miss these guys! The morning of Tuesday Jan 12, which is the travel out day, it worked out so that we all went up north together to shop, on the way to the airport. We did Hollo's amazing surplus paper store and Pat Catan's amazing art supply store, and then Lisa blasted off to Iowa in her parrot yellow Miada, and Paget drove her Subaru back to the east side of Cleveland, while we took Susan to the airport. Jimmy doesn't want a tee shirt! He's our very manly man. We got this piece "Baby Fridge," done in time to meet the January 15 deadline for the Quilt Art email group's challenge called "Refrigerator Wardrobes: The Life and Times of Kitchen Icons." It was started in August, 2001, during our Turtle Art Camp. I had asked each student there what they'd like me to keep in the baby fridge we got for our car, and it's all here. 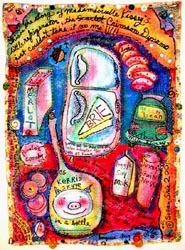 "Baby Fridge" is 30"h x 22"w.
You can see the challenge project on Quilt Art's site. 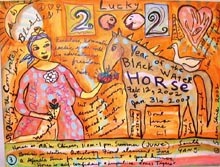 This is one of the four paintings I did at the end of December, 2001, on wood, about the year of the horse, which begins Feb 12. I made this little series before I did the ones at the top of this page. I'd been thinking about trying to sell paintings on wood on eBay. Only now I'm so into my quilting again, I haven't done anything about it. I do love to paint away tho! So I may do some more little series, and when I have enough to bother with learning all the ins and outs of eBay, I'll let you know. I also will put these in my Stuff to Buy section, but haven't yet! 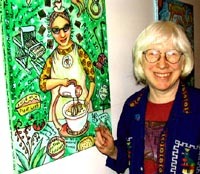 I'm caught up now in the next Kitchen Tarot pieces...finishing "The Rolling Pin / Chariot" and working hard to get the newly started "The Skillet / Strength" done in time for a Valentine show in Tremont at Doubting Thomas Gallery. 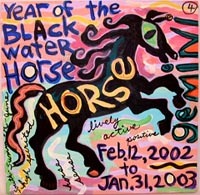 Anyhow, "Year of the Horse" is 12" x 12". Thanks for coming around! Hope you had a good time. Mardi Gras is Tuesday, Feb 5, so live it up!